First, it’s always interesting to see when a book fits into the timeline. I’m beyond thrilled that this is following the very first film. That time in the franchises history really has some of the strongest characterisation around and it’s like a huge playground for Ryan to explore and play in. I’m kind of jealous because seeing what he’s doing here and how much fun I’m having can only be a fraction of the fun he’s having! I love that we open with a trip to the Statue of Liberty and Dr. Zaius wanting to blow it up to rid themselves of any possibility of Taylor and his time here would be remembered. That is such an iconic image in popular culture and if you’ve never seen the films you still know what this image is and what it represents. Only the discovery made before that can happen will alter life as they know it. Big kudos to whomever it was that thought this up and shame on me for not having thought of it myself. I mean the TWO biggest franchises that have an ape of some species at it’s core having never met before yeah that’s a good premise. Throw in Ryan and Carlos and viola you’ve got a sure fire must read book on your hands. This does something that we’ve always wondered about but never really have we seen it explored. 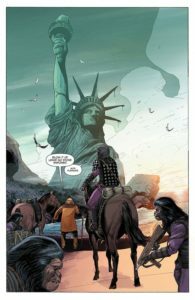 That’s the rest of the world in this case as Zaius and his hand picked team of explorers as they travel to the supposed origin of the giant ape and make a stop in Africa. I love this as we see that Ape Society seems to have taken the exact same route. The set-up we see is strikingly familiar and that is both fantastic and shocking at the same time. How hive mind are apes that so far apart with little to no contact that they would have such similar societal structures makes the reader think. I love that about what Ryan’s doing, making you think beyond what’s on the page or what we already know. Carlos is one the industry’s most underrated talents. The work he’s doing here is utterly phenomenal and his eye for storytelling is beyond reproach. 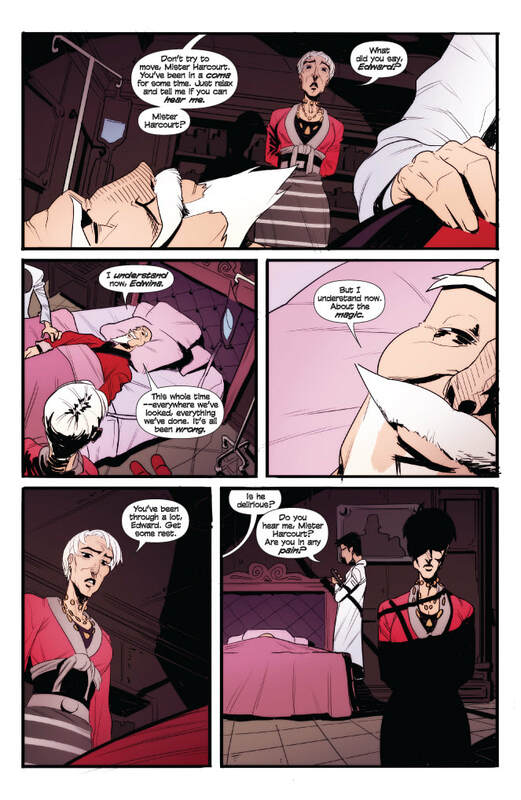 The way he uses page layouts through their angles and perspective not to mention he actually uses backgrounds as effectively as he does makes seeing his work a thing of joy. Plus there’s an amount of creativity and imagination involved in this as well and it works side by side with attention to detail in these beloved characters we all recognize. This is like a dream come true. The set-up and the pay-off at the end make this all worthwhile to me. The scope of the imagination it ignites inside me is immeasurable and the idea that I’ve waited this long is amazing to me. 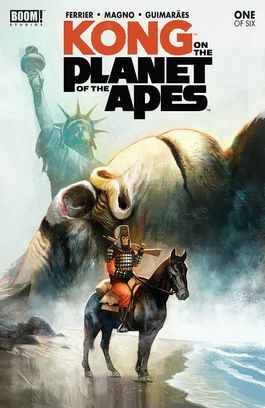 We’ve seen so many Planet of the Apes crossovers in the past few years but never any with Kong and to a crossover with their own titles like this should’ve been done a long, long time ago. This is that limited series you’ve been all yearning for! Summary: The damn dirty crossover event you demanded! Following the events of the first Planet of the Apes film (1968), Dr. Zaius and, General Ursus lead a small group of soldiers to the Forbidden Zone to destroy any remaining evidence of Taylor’s time among them. To their surprise, they discover…A KONG! 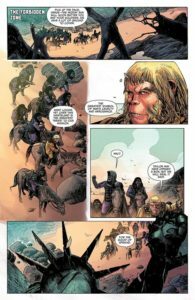 Now they must venture to Skull Island with Cornelius and Zira to discover the truth, but they may not survive the deadliest journey of their lives! Summary: Rich occultist Edward Harcourt lies on his deathbed. After a lifetime of searching for true magic, Edward thinks he’s found some answers, and he wants to pass them along to his grandniece, a gloomy teenager named Violet. But that may be a problem for Edward’s sister Edwina, who has her own plans for his legacy. Folks there’s a reason you see me review a lot of Action Lab books and that’s because they really are so damn good. This one to me feels like it can be a motion picture adaptation and honestly I kind of wish it were. Brendan has the structure, flow and way that this needs to unfold down to a science. Everything we see feels genuine, from the characters their characterisation and even the more shall we say outside the box thinking. This is a three issue series, another thing about Action Lab that I like as they don’t need to draw things out. The story gets told in the amount of time it needs and that’s a good thing in my book. Though of course if, and it will be, the story is really good then hopefully a sequel will end up being in the works. The pacing and revelations are such that yeah it does feel kind of fast and furious but then again it should with the amount of time this being told in. I like it though because again it feels real, genuine and like any kind of gathering under these circumstances would. 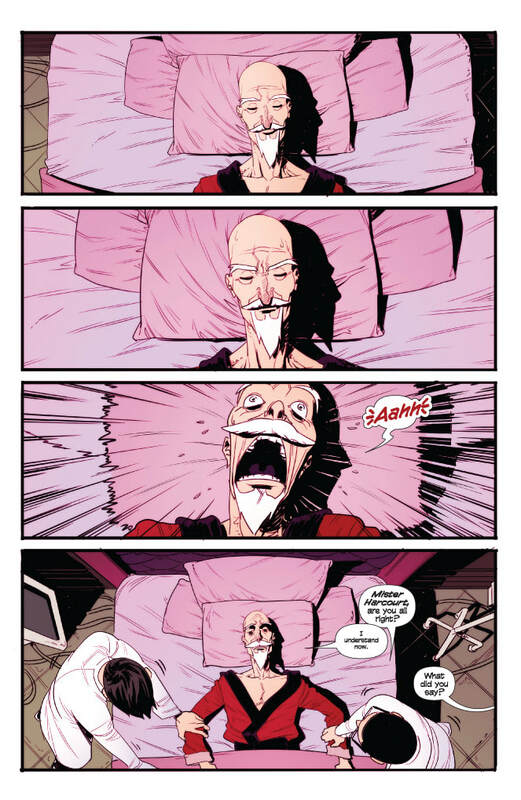 There are two openings here and by that I mean we see Edward awake from a coma, unexpectedly uttering something totally mysterious and interesting. Then we meet Violet who is travelling with her family on their way to see Great Uncle Edward. I love the dynamic of the two openings here, they are like night and day, aged and dignified on the surface and then modern with tons with attitude. It would seem like the two shouldn’t co-exist but they most certainly do. Jason and Josh do some great work bringing this to life here. I like how we see the old house for the first time and you get that whole sense of history, mystery and that twinge of horror when gazing upon it. The way that angles and perspective are shown and how the pages are laid out showcase a really good eye for storytelling. Like most books nowadays I want to see more backgrounds utilised especially here because the way this house could be used should leave the reader amazed and have it take their breath away. So the way the characters are introduced give off almost this whole murder mystery clue feeling. It’s as if that’s being set-up to feel that way on purpose. With Grandma being a mean old woman who will fight her brother tooth and nail on the massive occult collection they’ve garnered to the greedy siblings and their spouses who just wanna sell it all, yes money is the root of all evil right. So the kids are supposed to feel kind of secondary, well, except for Violet. She’s just sixteen and well, that’s the age where the idea of freedom is within her grasp and yet still ever so elusive and far away. I’m serious when I tell you that the characterisation here is beyond what you’ll expect it to be. So blend in man most think are dying and a slew of relatives who want different pieces of the pie for their own reasons and you’ve got yourself one heck of a combination. The way this can unravel has as many paths as there were ways to Rome in it’s heyday. Though there’s only one that really matters and it’s going to be a pleasure to see that one unfold around the others. The relationship between Violet and Boppa is special and it’s going to be one of those that changes their lives forever. Not surprising that this is as modern as can be and yet still feels like an Agatha Christie novel at the same time. Prepare to be amazed by the quality of storytelling here. Summary: As Sam attempts to discover the real reason the people of her town are being destroyed, she becomes aware of mind-rending creatures that feed off the sanity of their victims. It’s up to her to do something about it… if she can only keep her grip on reality. Alright, so not what I was expecting, which is always a good thing by the way. The idea behind the story that Sam has to come to grips with what’s happening around town is nicely done here. Saving the town that’s something else entirely and she hasn’t really wrapped her head or really been introduced to that yet. I mean it’s mentioned but then the book ends so we’ll have to wait for next issue to see how things play out with that. So the opening is eye catching thanks to Eli and with very few words it makes the imagination work in ways that should push you further into darkness. it’s great as far as openings go because it does draw you in and leaves you wanting to know more about the book. We don’t really know much about Sam but we do see of her is that she’s pretty serious about any job she takes on. Responsible and seemingly has a good solid head on her shoulders she makes for an interesting young woman. Now I don’t know who her friend Jerry is supposed to be, just friend, boyfriend or what role he plays and that’s a good thing. It leaves those around her more ambiguous and something to flesh out more over time. When she gets to her job do learn she’s a caregiver for an older gentleman and the really odd thing about all this is that no one is there to greet her, introduce her to her charge or why the note left her says NEVER turn off all the lights. The alarm bells should be ringing off the hook with the way her first day or should I say night starts. I might have out of curiosity stayed and seen what it was all about but then again I’m a glutton for punishment and I’ve also seen way too many horror pictures to pass on the chance to experience one live. Now while the story is strong and the structure of the book in how it all flows is great it’s really the work Eli does that sets the mood, tone and feel for the story. 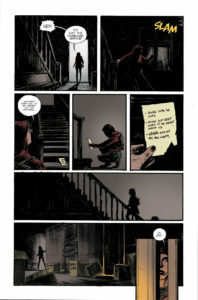 His use of page layouts with their angles and perspective are superbly done. The darkness we see and the way it plays tricks on the eye from Tristan are magnificent. 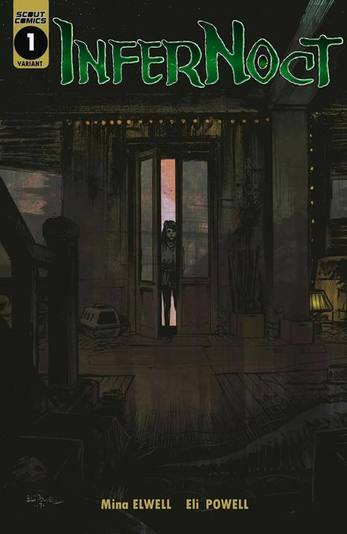 The one shot with all the lamps blew me away and it’s moments like that where the book really excels at creeping you out. 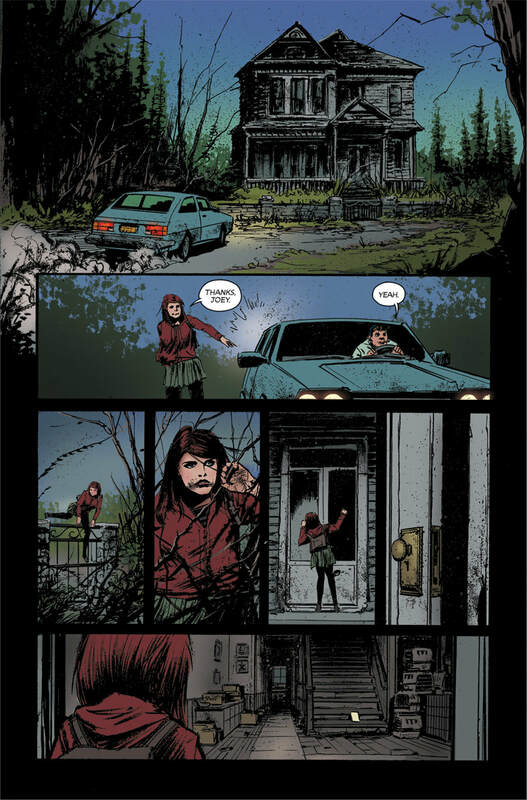 When the panels are full, see backgrounds, it’s much creepier then those without it because we get see the bigger picture. The last part of the book leading up to the last page is where things really go a little more crazy and it begins to take shape as the story weaves together. As I said the structure here is really good and that we get a better sense of what’s happening and are continually shown things that are almost classic horror tropes make you wanna scream at the book like we do at girls in the pictures that actually go into the basement. Mina, Eli and Tristan deliver a full service psychological horror thriller premiere with this one and it’s timing couldn’t be better with Halloween having passed us by recently. Editor’s Note: Head here to grab your copy of InferNoct #1! Tags: Action Lab: Danger Zone 2017, Africa, Agatha Christie feel, Alex Guimaraes, Answers, Ape Society yo!, BOOM! Studios, Boppa, Brendan Cahill, Carlos Magno, Comas, Crossovers!, Dr. Zaius, Ed Dukeshire, Ed's got problems!, Eli Elwell, Forbidden Zone, General Ursus, Indies, InferNoct #1, Jason Federhenn, Josh Burchaam, King Kong, Kong On The Planet Of The Apes #1, Legacies, Marshall Dillon, Mina Elwell, Mind-rending creatures with an interesting appetite for the mind!, Planet of the Apes 1968, Rich Occultist named Edward Harcourt!, Ryan Ferrier, Sam seeks answers to her town's dwindling population problems!, Sam takes any of her jobs she takes on very seriously!, Scout Comics 2017, Sister Edwina, Skull Island is gonna be wild for these Apes!, Small Press Love, Statue of Liberty go boom! 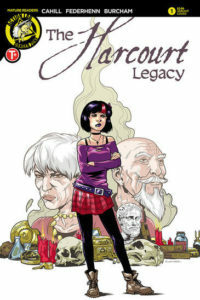 ?, The Harcourt Legacy #1, Tristan Elwell, True Magic searches, Violet the grandniece, We So Number 1!